Yes, we’ve been having some technical difficulties here at SkyTruth for the past 10 days. The outfit that hosts our image galleries and file libraries, Green Media Toolshed, just switched over to an entirely new software framework that promises to add some nice new features. Unfortunately, it’s having trouble displaying TIFF-format images as thumbnails; and many of the links to images and files sprinkled throughout this blog are not functioning now. We’re assured that the folks at GMT are working hard to resolve these problems. Until they do, if there’s something you want but can’t get, send us an email. 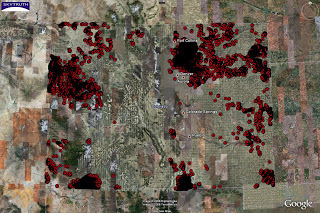 We decided to see how many oil and natural gas wells have been drilled in the state of Colorado. Those without Google Earth yet (what’s holding you back?) can see statewide images of the well distribution in our online gallery. 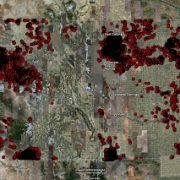 Google Earth users are invited to download the KMZs and explore Colorado drilling at your own speed. Leave us a comment to let us know if you think this is useful, and tell everyone about the interesting things you find.